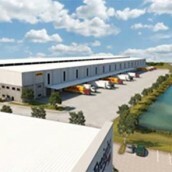 DHL Express, the world’s leading international express services provider, unveils its first green facility in Sub-Saharan Africa. The facility, located in Bryanston, Johannesburg, has a state-of-the-art 10,000-litre rainwater harvesting system and rooftop solar energy generation plant, which significantly lower the building’s carbon footprint and reduces energy consumption by 55%. The reduced energy consumption is partly due to a 34kW solar photovoltaic system that reduces the demand for grid power by at least 25%. The facility also uses highly efficient LED light bulbs in place of conventional ones. This lighting technology, coupled with sensors designed to automatically turn off lights installed in highly-used office areas, contributes to energy savings of up to 35%. A majority of the lighting used in the warehouse is being switched off by a timer when dusk sets in. The facility’s energy consumption and solar energy production is monitored and reported in real time. “Even though the Bryanston project is still in its infancy, early results based on performance indicate that despite the cost of electricity and water increasing, the estimated payback period for the building’s upgrades is currently around three years, down from an initial estimate of 4.5 years,” Beckley adds. . The energy savings of the facility will be tracked for the next three months, after which DHL Express will begin the roll-out of green upgrades to additional sites across Sub-Saharan Africa, including the rest of South Africa, Nigeria, Ghana and Mozambique. “The last and critical outcome we hope to achieve out of this ‘greening’ of facilities is to educate the employees on the importance of working together to attain our collective zero emissions goal. We are in the process of pushing through green policies, geared at saving resources and reducing carbon emissions, which will help shape a company culture. This is the first step in building greener, more efficient supply chains throughout our African operations.